Huge stack of piled sheep and cow skins. Australia, 2017. Copyright Jo-Anne McArthur / We Animals. Two major reports released within the fashion industry released in 2016 and 2017 are damning for businesses that profit from animal fibers like leather, silk, cashmere and wool – and it’s also pretty critical of conventional cotton. These reports come at a crucial time for an industry that has had a serious lack of concrete data from which to draw, for which Alden Wicker at Racked made a compelling case earlier this year. “One reason for this ignorance might be that scientists and advocates tend to look down on fashion,” said Wicker. A massive study called Pulse of the Fashion Industry, which was published by Global Fashion Agenda and The Boston Consulting Group, a respected global leader in business strategy advising since 1963 – was unleashed in May of 2017 to coincide with the Copenhagen Fashion Summit, and delivered some serious wake-up-calls. The report gave a failing grade of 32 out of 100 to the fashion industry – a weak pulse indeed – using the Sustainable Apparel Coalition’s Higg Index as a data set source and a cradle-to-gate analysis of materials, which places the burden of responsibility on the producers, not the consumers. This is a welcome shift from an emphasis on expecting shoppers will buy less, wash on cold, hang dry, repair, recycle and dispose conscientiously – activities that are difficult to measure, let alone enforce. Among the report’s fierce call-to-actions and startling projections is a conclusion that’s not sitting well with animal agriculture industries. 3 OF THE 4 WORST MATERIALS FOR THE ENVIRONMENT, PER KILOGRAM, ARE DERIVED FROM ANIMALS, ACCORDING TO THE RESEARCH. Cow leather takes the prize for most damaging, with silk being a close second. Not surprisingly, conventional cotton comes in third, followed up by wool, just behind in fourth. So what are the remaining 10 materials in the rankings with the smallest impacts? Human-made fibers. Materials like PU leather are found to have less than half of the environmental impacts as their animal-derived counterpart, shedding much light on the heated debate regarding the sustainability of vegan leather versus cows’ skins. Likewise, acrylic, polyester, spandex and rayon fibers are significantly less damaging than wool and silk, according to the research. The popular binary of ranking synthetics as the lesser of two main fiber categories (with the other being “natural” fibers) appears to be incorrect, at least from a sustainability standpoint. MATERIALS LIKE PU-LEATHER ARE FOUND TO HAVE LESS THAN HALF OF THE ENVIRONMENTAL IMPACTS AS THEIR ANIMAL-DERIVED COUNTERPART. Animal agriculture has seen large-scale condemnation in multiple arenas over the last decade, like meat production being linked to climate change with a near consensus among global climate leaders such as the United Nations FAO. This information, coupled with growing ethical concerns for the billions of animals killed for their body parts every year and an increasing link between animal products and disease, has been a major driving force in the development of increasingly-funded and valuable solutions from clean meat to biosynthesized spider silk fibers, bio-based nylon, poly, and PU, Nanollose and lab-grown leather. By implementing positive changes, the report estimates almost $190 billion in annual value for the world economy by 2030. That’s a lot of incentives for innovation. 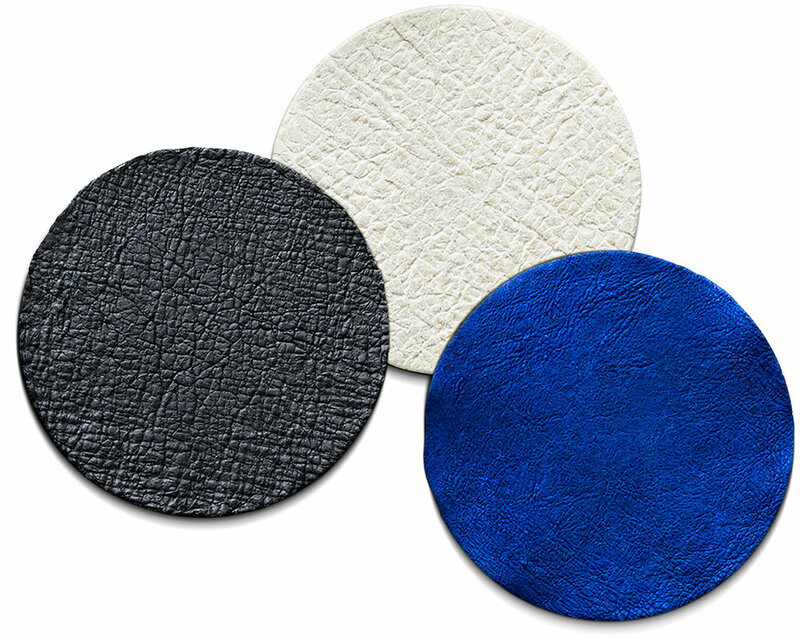 Zoa™ bioleather materials from Modern Meadow. Another report, released by the luxury fashion conglomerate Kering in 2016, came to similar conclusions. Leather is, by far, Kering’s most damaging source of environmental impacts. Similarly to the Pulse report, synthetics are measured at about half of the impacts of leather. Their report, the Environmental Profit & Loss (EP&L), also singled out cashmere as having the largest impact among their non-leather animal fibers (mohair, wool, cashmere, vicuna, etc). The distinction between skins (leather) and hairs (“animal fiber”) is something to pay attention to, because often there is crossover. Sheep and goats, for example, are both sheared for their hair and eventually killed for leather. If combined, animal materials are the most detrimental category of textiles where the environment is concerned. 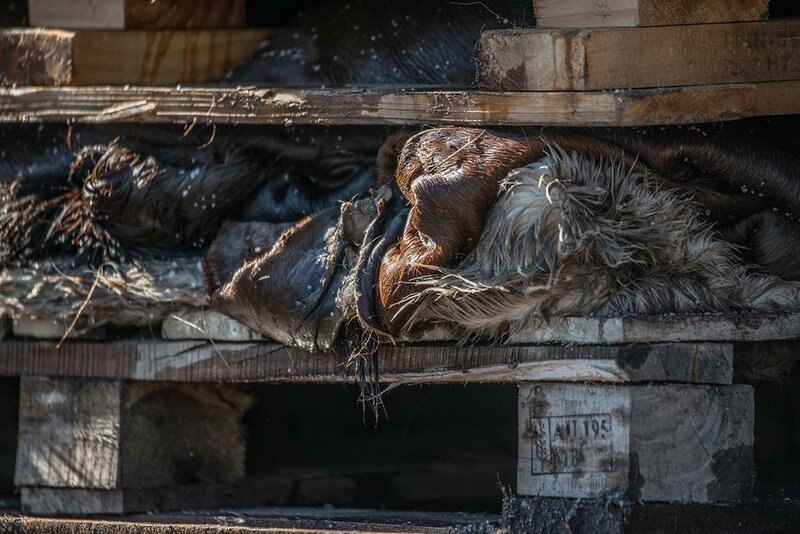 While Kering does attempt to address some issues with tanneries, the research indicates that even if the tanneries were removed from the equation, 93% of the impacts happen before the skins arrive at the tanneries. Therefore, we must be vigilant against greenwashing in the form of “vegetable-tanned” leather and “chrome-free” leather. Something like PU (polyurethane) leather outperforms animal skins environmentally by far, and this isn’t even considering the soon-to-be-made plant-based PUs. Kering should be applauded for taking this step in self-analysis and self-criticism – certainly a risky thing to do. But they are also counting on reaping some of those huge financial benefits of implementing sustainable innovation, so it’s not all altruism. The authors of the Pulse report should also be lauded for creating invaluable resources and ongoing research with the goal of motivating and empowering the fashion industry. Data is crucial for being taken seriously, and that can trickle up to create meaningful legislation and drive strategic growth and change from points of leverage. Basically, the takeaway is that anything requiring large amounts of land, especially cattle and even conventional cotton, are going to have significantly larger impacts on the environment than human-made materials. IF WE’RE GOING TO ADDRESS THE VERY WORST PROBLEMS FIRST, WHERE COMPANIES SHOULD BE FOCUSING IS REPLACING ANIMAL MATERIALS WITH SUPERIOR HUMAN-MADE MATERIALS. And that doesn’t mean just switching over to conventional rayon – it can mean investing in plant-based, biodegradable rayon. It can mean taking an active role in getting behind the companies that are currently making ground-breaking materials, similar to how Stella McCartney has recently partnered with Bolt Threads. Pushing back against the data to defend business-as-usual will soon not only be a bad PR move, it could be criminal if environmental legislation is introduced. We need everyone from fashion students and scientists to designers and investors to aspire to create and use emerging materials from the fields of cellular agriculture (growing or brewing protein fibers like leather, silk and wool in the laboratory), recycled materials like Newlife and The New Denim Project, and hi-tech synthetics like bioplastics. In order to do that, there has to be rewards. The recent Biodesign Challenge, the CFDA + Lexus Fashion Initiative, The Global Change Award, The Kering Award for Sustainable Fashion, the Green Carpet Challenge, the Ecochic Design Awards, New Harvest, IndieBio and a handful of others are a great start. But there needs to be much more resources put into this effort, and guidelines must stay in pace with the latest data, placing emphasis on the biggest problems, like replacing animal materials. 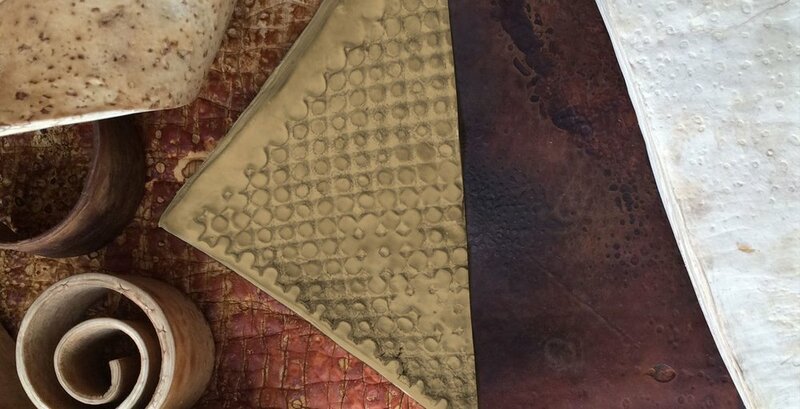 This is exactly what happened with VEGEA Wine Leather – a group of young Italians who figured out how to make leather from the leftovers of wine production; grape skins and pulp. They were awarded €300,000 this year to take their concept from prototype to production by winning the top prize from the Global Change Award. VEGEA leather made from grape marc. Finally, one reason why many designers do not use the latest innovations isn’t because they don’t want to… they simply don’t know they exist or how to look for them. And when they find them, getting access to a few yards for sample-making is next-to impossible. Textile trade shows, suppliers, universities, fashion media and sourcing experts must do a better job of identifying, organizing and creating access to the best innovative materials. The Biofabricate conference does a great job of this, but in New York City there is still nowhere a designer to go to see and source the latest innovations in sustainable materials, from something a simple as recycled polyester, recycled cotton to Piñatex, Mycoworks and Apple Leather. If we want change to happen quickly, we’ve got to take fashion seriously, take the data seriously, and make it rewarding, fun and easy for designers to get their hands on the good stuff.